So you know how I’ve been talking about my garden every week? Well I have finally got to a stage where I can see a big difference and my hard work has paid off. I even got a text message from my brother who drove past and commented on how good it looks – bonus! Saturday I pulled a massive plant out, with a shovel. I was so stoked with myself. In my head I was singing “I don’t need a man to make it happen”.. yeah, Pussycat Dolls. Bless them. So on top of this, I also spent a good deal of time going through all my old Gourmet Traveller magazines and pulling out the recipes I want to make. I figured, as much as I love them all stacked nicely on my bookshelf, I’ve never going to cook anything from them if I don’t rip out the good recipes. So I did, and found a mass of cocktail recipes I want to make! Among those magazines was Donna Hay’s new one (Issue 59). 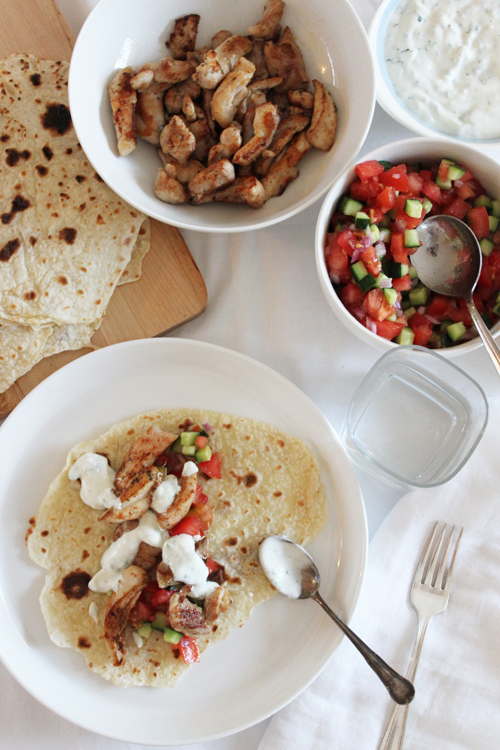 Being a nice balmy Sunday, I really wanted to make her Grilled Chicken Tacos with Salsa Verde. Only I don’t have a grill, and I’m not the biggest fan of salsa verde. I love herbs when used as adding a touch of flavour to a dish, but not bam-in-your-face-sauce. There was a recipe for making tortillas, and you know how I feel about making bread. So it was done. 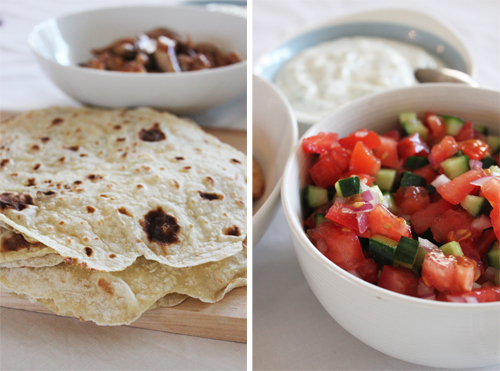 I swapped the salsa verde for a simple tomato and cucumber salsa, and made an awesome minty yoghurt side to go with it. Place the chicken in a medium bowl and sprinkle over the salt, chilli, oregano and paprika. Mix well to coat in all the spices and set aside in the fridge. Place the diced tomato, cucumber and red onion in a serving bowl. Add a slug of olive oil and a pinch of sea salt and mix well. Set aside in the fridge. Place the yoghurt, chopped mint, garlic and lemon juice in a serving bowl. Add the cumin and salt and mix well. Set aside in the fridge. In a large bowl, add the flour, salt and butter. Using your fingers, rub the butter into the flour until you have a bread crumb like consistency. Add the boiling water and mix with a wooden spoon. When it comes together, pour the dough onto a well floured surface and knead for 2 minutes. The dough will become smooth very quickly. Divide the dough into 12 equal size pieces, and roll each piece out to about 20cm round. Note - they will shrink a little when you cook them. Heat a non-stick fry-pan over a high heat, and cook each tortilla until it becomes lightly browned on each side. Set these aside in a tea towel to keep warm. Preheat a fry-pan or barbecue over a high heat. Place a good slug of oil, and cook chicken in batches, until cooked through and brown. 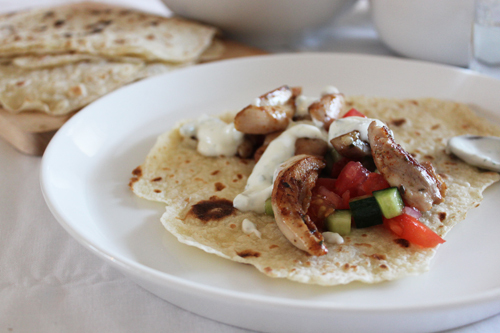 Serve the chicken with tortillas, salsa and yogurt. Fresh Dill, have u got that growing in your garden???? I can't find it anywhere in Perth!!! Its the best flavour and use it with mint in your yogurt. I love homemade tortillas and Donna Hay...though her magazines are pricey here in the US, they are definitely worth the splurge! That salsa sounds so refreshing too! Another very delicious recipe on that blog, wow. And again, beautiful photos. Captomcook - dill would have been a nice touch too! Although it was very minty.. I don't have any dill growing, but I find it in most supermarkets and definitely greengrocers! Cindy - Donna Hay's website is quite good, I usually grab some ideas from there..